A pearl set in a sapphire sea is the image that comes to mind when one considers this cosmopolitan paradise isle. Mauritius has been influenced by very different cultures, resulting in a marvelously diverse and effusive population who speak French, spend Rupees and drive on the left. The people are welcoming, warm and friendly. Fishing boats set out daily beyond the string of coral reefs that stretch from one beach to another, to return at sunset with their daily catch. Mauritius is a year round destination, with moderate temperatures almost guaranteed. The clear calm waters off the coast make conditions ideal for all kinds of water sports. On offer is some of the best game fishing, snorkeling and scuba diving opportunities to be found, not to mention the wonderful sun-bathing as well. Mauritius lies like a rich green emerald in the turquoise velvet of the Indian Ocean. The capital and main harbor of Mauritius, Port Louis was founded by Mahe de Labourdonais in 1735. Around the main site, the Place d’Armes, several buildings of French colonial style can be found, namely the Government House, the Supreme Court and a history museum and the Municipal theatre all built during the 18th century. Port Louis also has two beautiful cathedrals, one Protestant and the other Catholic. Around the town at the foot of the mountains is the racetrack, however, the best view is from the Fort Adelaide, a strong citadel in the era of William IV. The waterfront offers a variety of entertainment including shopping, eating, cinema and theatres. To the south of Port Louis, you’ll find Le Reduit, a colonial residence surrounded by superb gardens, built by the French for the Governors of that period. From Port Louis you can go to Beau Bassin, Rose Hill, Quatre Bornes and Vacoas. Only ten minutes from Port Louis, is The Domaine Les Pailles, a natural reserve that extends itself over 1,500 hectares at the foot of a mountain range, where visitors can experience the old island life style in an enchanting natural environment brought up to date by the passion of several professionals. Domaine Les Pailles offers a variety of features including gastronomic restaurants “Le Fouquet’s”, and “La Canelle Rouge”, an Indian restaurant “l’Indra”, a Chinese restaurant the “Fu Xiao”, an Italian restaurant ” La Dolce Vita”, a casino, a pizzeria, a pool, miniature golf and stables. You may also choose to tour the mountain — in a 4 x 4 vehicle, on a cart or a small train — where deer, monkeys and rare birds live in perfect harmony. The garden is fitted with a mill, a perfect replica of the first sugar mills on Mauritius, allowing visitors to see how sugar was produced. The distillery refines the rum of the Domaine. Curepipe is the main residential town of the island offering excellent shops and several restaurants. Between Curepipe and Floral, is the spectacular Trou aux Cerfs, an extinct volcano approximately 85 meters deep and as wide as 200 meters. From here you are afforded a panoramic view of the island. Mahebourg is built on the splendid bay of Grand Port, which was the theatre of the naval battle between the French and the British in 1810. Since then it has evolved into a fishing village, while retaining its secret charms from the past. This area was the first part of the island visited by the Europeans as the Dutch sailors landed at Vieux Grand Port. 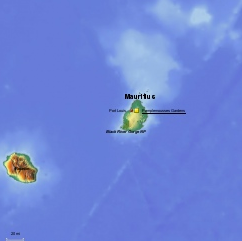 They named the island “Mauritius” in the honor of Maurice de Nassau and the bay of Grand Port, ”Port Warwick”, after the admiral who was commanding them. The historic museum at Mahebourg tells the story of the battle of Grand Port. In the old French house of the 18th century where the museum is located, the British and French chiefs, Commodore Willoughby and Captain Duperre, both wounded in the battle of Grand Port, were restored to good health. The museum contains souvenirs of this battle as well as a collection of cards and stamps illustrating Paul and Virginie. An artisan village built in ‘creole’ architecture is located adjacent to the museum, offering a variety of handicrafts products. This park of 6, 574 hectares is a conservation area to protect what is left of the indigenous forests of Mauritius and offers visitors the chance to enjoy the magnificent views and to see some of the endemic plant and bird species. The National Park is accessible from Vacoas via La Marie and Mare aux Vacoas. Several paths afford wilderness walks bringing you closer to nature. On the Plaine Champagne road towards Chamarel, an easy walk will lead you to Alexandra Falls – with its panoramic view of the south and Bel Ombre as well as spectacular view of the Black River Gorges. Souillac is a village located on the rough coast of the Savanne. It obtained its name from François Vicomte de Souillac, who was Governor of the island from 1779 to 1787. Today, the main focus of this small village is fishing. The very steep cliffs swept all year round by the powerful breeze of the ocean, contrasts with the calm beaches of the north. The tranquil garden on the sea front takes its name from Doctor Charles Telfair, secretary of the Governor Farquar (1801-23) and founder of the Royal Society for Arts and Science. On the cliffs sculpted by the waves, the Coral House, where Poet Robert Edward Hart lived, has been turned into a museum. To the south of Souillac, Gris-Gris, churned by the waves into a fountain of foam, protrudes itself into the sea. Souillac was also the subject of the work of Paul-Jean Toulet, another French poet who lived in Savanne for some years. Le Val Natur Parc is situated in the south east of the island at Cluny, in the district of Grand Port. This natural park is in the heart of a valley surrounded by luxurious vegetation. It extends itself for over 100 acres. Ponds of carp, fresh water fish, shellfish as well as birds, monkeys, deer and endemic plants can be seen.